Silicate of aluminium and iron ferrous of Al4Fe[Si2O10](OH) 2, unusual natural mineral, formative junctions of crystals of lorenzenite, reminding a cross in a due form. Red- brown, brown, black, rarely dark blue (lusakite) color, Mohs hardness 7. 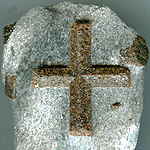 Otherwise Staurolites (Granatite) name Cross stone. 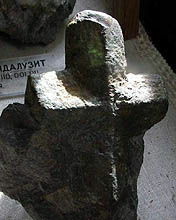 This feature is reflected in the name of stone (Greek stauros is a cross, lithos - stone), it is known at ancient under the name lapis crusifer, stone- cross. Were very popular in Russia as character of christianity. Curiously, that separate parts of cross of Staurolite (Granatite) can intersect not only under the corner of 90o but also under the corner of 60o. The cross of the last type is known in the christian world as a "cross of sainted Andrew" (Andrew, Simon Peter's brother, preferable in Ukraine, CIS, "maple-leaf" - in Canada, America). Day of the Stavre. Erecting of Chestniy and Vivifying Zhivotvoryaschiy Cross the Exaltation of the Holy (Precious) and Vivifying (Life-giving) Cross Lord (one of great, included in the number of immobile dvunadesyatykh khrist. holidays; celebrated on September, 14/27 in honour finding (or finds) in the first half 4 in. by an empress by Helen, mater'yu of emperor Konstantina Great, cross which Jesus Khristos was crucified on; and tzh. related to the triumph of khrist-va at Konstantine Great, k-ryy erected in place of Calvary and Coffin Lord temple of Resurrection), the Exaltation (Raising Up) of the Honoured and Life-giving Cross; the Feast of the Exaltation of the Holy Cross of Our Lord, the Elevation of the Life-creating Cross. Staurolite widely widespread in Russia on territory of the Kola (Kolskiy) peninsula and Sonth Ural (Russia, CIS). This interesting mineral often be found among mica asp slates. The deposits of Staurolite exist also in Italy, France, Germany, Austria and some other countries. On territory of the USA they are found in the states of Verdzhiniya and Montana (USA). On jeweller business of Staurolites not used practically, it is not a precious or carpentry mineral, however on sale it is possible to find crosses, done from the accrete crystals of Staurolite (as cleared from slates, so with the piece of rock), and Staurolite insertion in handicraft jeweller silverwares and nickel silver, and also in wares from a skin. 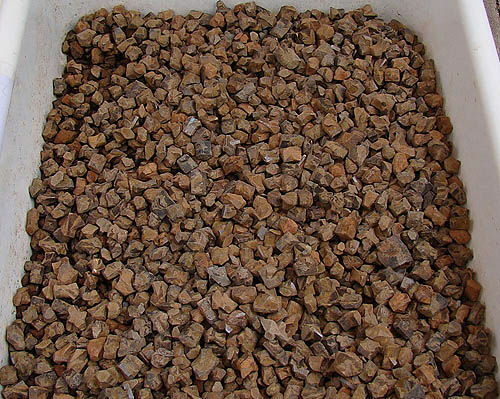 It is hundred-per-cent-natural natural education, crystals of accrete, grow together naturally. 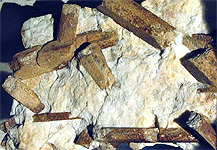 Handler of stone must be able to select from general mass of junctions and surrounding rock such junctions of crystals which have a regular shape and will be in demand for buyers - Staurolites: rectangular christian and slanting Andreevskiy Andrew's crosses, junctions in form maple-leaves or Hexacorallia stars. Educations and junctions of not nice (unaesthetic) form of jeweller value however much insertions in wares usually do not have is individual perception of proprietor. This mineral can contain radio-active components. From point of physics of crystals, correct and safe from point of level of radiation (to 19-24 milliroentgen/hour) there are Staurolites, crossed under the corner of 60 or 120 degrees - exactly they are uncrippled a radiation and more safe in circulation and carrying - will pay attention on relatively safe brooch of hand-worked with Staurolite ("Andrew's Andreevskiy cross" in mica slates under the corner of 120 degrees - in a form "maple-leaf"). If Staurolites accrete under the corner of 90 degrees, probability is high that it displacement of growth of crystals is caused the enhanceable level of radiation of Staurolite (from 29-32 milliroentgen/hour and higher) are changes of autogrowth (autoepitaxy) of crystals of Staurolite on itself under influence of enhanceable background of radiation (norm of natural radiation - 17-24 milliroentgen/hour). "Correct" (direct, right angle) cruciform Christian orthodox Staurolites- crosses (especially exempt from a containing rock) at the protracted carrying on a neck can cause the radiation damage of thyroid gland (glandula thyroidea) and cause its changes (including oncologic). Analogical local damages can be caused the protracted carrying of dangerous Staurolite directly on a breast or in the pockets of masculine pantaloons. From the high background of radiation these dangerous for the health (at the permanent carrying) of Staurolites men, anchorwomen, choose the solitary way of life - and it is harmed this the health (behavior the unhealthy way of life). Safely to carry Staurolites with the low level of radiation without depending on their kind on hands (in rings and bracelet-"wristlet") and on feet - as possible farther from a thyroid, birth-marks, large birth-marks (especially protuberant), from a breast, superficial lymphatic knots etc. the objects easily struck a radiation on the body of people. In any case from considering of safety and ecofriendlyness it is not recommended to carry potentially radio-active stone and minerals constantly and to hold the large standards of such minerals in an apartment or working cabinet (a house and apartment is a not mineralogical museum with the possible level of radiation from 32 to 120 milliroentgen/hour and higher for specexposition and mineralogical archives state institutions). A radiation from a point object decreases proportionally to the square of distance to this object. Stepping back on 2 meters from a dangerous object, you will decrease the level of study from this object in 4 times. Stepping back on 10 meters, you will decrease the level of radiation of this object in 100 times. If a point radiant has an object 2000 milliroentgen/hour at the natural background of radiation of environment 19 milliroentgen/hour (totally 2000 + 19 = 2019 milliroentgen/hour), stepping back aside on 10 meters, you will secure itself to the level of radiation 20 milliroentgen/hour from an object and 19 milliroentgen/hour from an environment (total the general level of radiation from an object and environment will appear already 20 + 19 = 39 milliroentgen/hour). Dangerous is a direct contact with a body and carrying on the body of point and diffuse sources of radiation and radio-active components (an about 50% radiation is taken in at a contact with the external surface of body and an about 100% radiation - at a reception into a radio-active or infected object). Most dangerous is a direct reception into radio-active components, stone and minerals, including pounded in powder and especially soluble in a liquid. All of wilful injections of radio-active preparations are categorically forbidden. On the left. 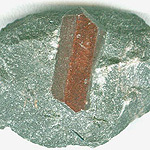 Staurolite, Granatite (twins to 3 sm). Antananarivo of Madagascar. Photo: © A.A. Evseev. On the right. Staurolite, Granatite (twin ~10 sm). Klermont, New-Gempshir, USA. Photo: © A.A. Evseev. Size is shallow and direct (right angle) "crosses" do not meet. 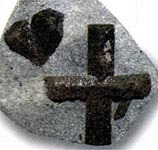 No wonder that due to the form of Staurolite, Granatite in form correct christian cross since olden times considered strong christian amulet charm, able to protect a people (and in particular case child) from influence of black art. 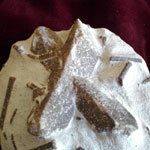 Crystals in form cross, crossings at right angles, are most valued from point of magic. Star-shaped Staurolites, not extracted from a rock, dark on a light-сером background is more decorative. Other name of Staurolite, Granatite true, is out-of-date - stone happiness. 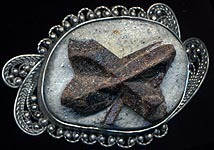 Due to the form of Staurolite, Granatite in form cross considered strong christian amulet, charm, talisman able to protect a people (and in particular case child) from influence of black or heathen art. As he takes divine character from the proprietor of wicked perfumes. Even the presidents of the USA did not go round him the attention. Roosevelt, Wilson and Harding carried Staurolite, Granatite as an amulet. Staurolite, Granatite is contra-indicated none of signs of Zodiac. Can carry him all, a correct cross (crystals, crossed under the corner of 90 degrees) is carried by high-spiritual and devout people. Stavrolity is most rotined undevout people in form maple-leaf or Andreevskiy Andrew's cross (crystals, crossed under the corner of 60 or 120 degrees) - recommended to carry just the same Staurolites. To the origin of stone beautiful legend is related. Spring, where was stone will find, forest fairies very loved. They led round dance with singing round a source, songs sang. And once, in a height merriment, an elf flew by them, got down to the fairies and told the tale of woe about the crucifix of Christ. Fairies burst into tears, and their tears, falling on earth, grew into crosses.